Here at Greener Horizon, we work with estates and large homes to provide grounds management and high-end residential landscaping design and construction. We work directly with clients to get your landscape to peak performance, and then maintain it throughout the year. In addition, we provide consultation and designs for further enhancing the beauty of your landscape. All of this together is the goal of estate management: to provide curb appeal to your home and convenience to you. Let’s walk through the parts of estate management. A critical part of the estate management process is a Dedicated Project Manager, your point of contact with your landscaping company. Their goal is to make your life easier, to learn about any issues, deal with problems, and keep you informed about the landscape of your estate throughout the seasons, projects, and regular maintenance. When it comes to managing the grounds of your estate, your dedicated project manager should always be reachable via phone or email. “White Glove” Plant Care: From flowerbeds to ornamental shrubbery to ancient trees, every plant’s health is maintained according to the season and client needs. Lawn & Grounds Maintenance: Maintaining the health and height of the lawns and all other ground and garden coverings, doing everything from mowing to laying down new mulch. New Project Management: Your landscape should change with your needs. As such, design and build landscaping are always at your fingertips, with your manager ready to advise. Hardscape Maintenance & Prep: Want your patio cleaned and the outdoor furniture taken out of storage, cleaned, and put in place? All part of the service. Seasonal Care and Displays: Different seasons bring on different needs, as well as different holidays to celebrate. Both combined make sure your landscape is always at its best. While every estate’s plan may look different, let’s look at a hypothetical year for a client who decided to partner with a full-service landscape company for estate management. 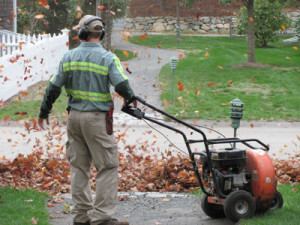 In fall, it’s all about keeping the ground clear of leaves and preparing your landscape for winter. Monitoring weather is key so you can enjoy your outdoor living space for as long as possible before it is shuttered. It’s important to keep your plants safe and your grounds safer during the winter, with everything from winterizing your irrigation to keeping your walkways clear of snow. Putting on a holiday party? We can help with amazing display lighting and seasonal decoration. Time to break everything out of its winter slumber, from your plants to your patio furniture. Promoting plant growth and restocking your gardens with seasonal plants is key, along with new landscaping projects once the ground has unfrozen. Maintaining and constraining plant growth in the summer leads to a perfectly trimmed and mowed landscape. Landscaping projects are conducted and set for the year. Enjoy the summer! At Greener Horizon, we provide full estate management services, from top-level landscape design and master planning, down to the details of plant health care. Contact Greener Horizon today to learn more about our landscaping services and season grounds management packages, and request your complimentary consultation today.